You are here: Home Sports Justin Rose overcomes final round wobble to edge out Australia’s John Senden at US PGA BMW Championship. 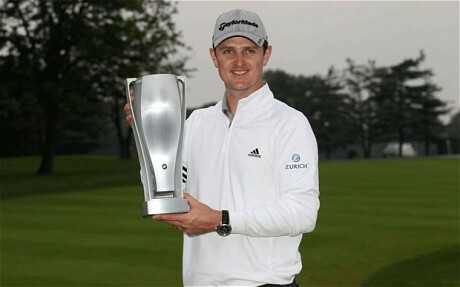 Comments Off on Justin Rose overcomes final round wobble to edge out Australia’s John Senden at US PGA BMW Championship. Justin Rose overcomes final round wobble to edge out Australia’s John Senden at US PGA BMW Championship. Justin Rose chipped in for a birdie from 11 yards out on the penultimate hole to hold off Australian John Senden and take a wire-to-wire victory at the US PGA BMW Championship. In rainy conditions at Cog Hill, the 31-year-old Englishman, who opened with a 63 on Thursday, closed with a par 71 to finish 72 holes on 13-under par 271 and defeat Senden, who carded a 69 Sunday, by two strokes. Rose made a bogey at the par-5 15th to leave him only one stroke ahead of Senden, but the chip-in at 17 helped him shake off a history of struggles with last-round leads and take the $1.44 million top prize of the $8 million event. Australia’s Geoff Ogilvy fired a 69 to finish third on 274, two shots ahead of World No. 1 Luke Donald on England with American Webb Simpson fifth on 277. The penultimate event of the US PGA play-offs decided the 30 season-point leaders for next week’s Tour Championship, where a $10 million play-off prize will be awarded to the points champion, not necessarily the event winner. Rose put himself third among the five overall point leaders who can claim the $10 million with a victory next week in Atlanta. Simpson, Donald and Americans Matt Kuchar and Dustin Johnson are also among the top five. Ogilvy qualified for both the Tour Championship as well as the last spot on the Internationals team for the Presidents Cup against a US squad in November at Royal Melbourne Golf Club in Australia after being borderline for each. Rewards for reaching the Tour Championship include Masters, British and US Open invitations as well as at least $300,000 in prize money for the week. Senden needed a victory to have had any hope at making the Presidents Cup on points, but he could still be one of the captain’s choices that Greg Norman will announce on September 27. Rose and Senden booked themselves spots in the Tour Championship with their strong BMW showings and South Korean Yang Yong-Eun, on the cut line when the day began, snuck inside the top 30 at 28th, four spots behind Ogilvy. Aussie Aaron Baddeley was 27th in points to make the Tour Championship field followed by Yang, Sweden’s Fredrik Jacobson and American Bo Van Pelt. Scotsman Martin Laird was 31st to barely miss the season-ending event with reigning Masters champion Charl Schwartzel of South Africa 32nd and Colombia’s Camilo Villegas 33rd. Laird opened with three bogeys in four holes but his charge of three birdies in the final five fell just short. Schwartzel took bogeys at three of the last four to drop out. Villegas fired a 66 to share sixth but also missed out. Rose won titles last year at the US PGA Memorial and National events but blew a three-stroke lead to lose at Hartford last year and put himself at risk on Sunday. Rose took a bogey at the par-3 second but birdied the par-3 sixth and par-4 seventh, boosting his lead to five strokes over Senden. After finding wet rough on his approach at the par-5 ninth, Rose missed a 25-foot par putt while Senden birdied the ninth and 10th to trim the margin. Rose’s bogey at the par-5 15th left him only ahead by one. After Senden missed a 40-foot birdie putt at 18, Rose rolled his 32-footer to the edge of the cup, tapped in for par to win and celebrated on the green with wife Kate and young son Leo.